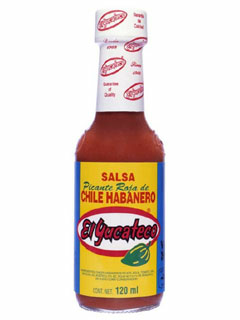 Red Chile Habanero Sauce by El Yucateco 4 oz. It is made with fresh red habanero peppers, tomato, select spices and seasonings. Its thickness and texture allows it to be savored by the most demanding palate. Red Chile Habanero Sauce Heat: 5,790 Scoville Units. The Scoville scale is a measure of the hotness of a chilli pepper or anything derived from chile peppers or hot sauces. The scale was named after Wilbur Scoville who developed the test in 1912. Salsa Habanera roja. El Yucateco es una marca muy Mexicana de la peninsula de Yucatan. this is just a wonderful hot sauce' hot and spicy full rich habanero flavor ' wish it came in a really big bottle. Para los amantes de buen chile picante no tiene igual ,y dependiendo de la comida esta es la salsa perfecta, para mi en sopas no hay salsa mejor .. I never realized how good a habanero hot sauce was until I tried the El Yucateco brand! Mucho caliente!!! Best sauce out there. Another sauce that is great mixed with refried beans and also rice. A little on a taco goes far. Also great in cheese dip.